As you learned from a previous tutorial, composing messages and sending emails from Facebook is quite easy, and requires little to no training especially to someone who has already used an email program or webmail client like Hotmail, Yahoo Mail, or Gmail. But, just like you can email video messages from Facebook, you can also send pictures in a email message, either by emailing a link to a picture you found online, uploading an image from your computer, or even by taking a photo snapshot of yourself using your webcam or your computer's external video camera. This tutorial will show you how to do the last two, and a later tutorial will explain how to email links to web pages (or pictures) from Facebook. As soon as you do, Facebook will open the new email message popup: type the names and / or email addresses of the other Facebook users you want to include as recipients when you send your photo, and optionally type a Subject and some text in the message body, as you always do with regular messages. Facebook will now give you two choices: either upload an image you have on your computer, or take a picture of yourself (and others) using your computer's camera or laptop webcam. To cancel and send your message without picture attached, just click on the "x" close button. To pick an image file from your computer, just click on the Upload a Photo link on the left, then click on the button that appears below (a "Browse" button on Windows or Linux, or "Choose File" on Mac OS X). Facebook will open a Browse dialog that lets you navigate through folders and subfolders on your PC or Mac - select the picture you want to send and you are done, Facebook will take a second or two to attach it to the message (a later tutorial will explain in details the "Upload via email" feature). To send a picture through Facebook using your webcam instead, click on the "Take a Photo" link on the right. As soon as you do, Facebook will slide down the bottom part of the message, and show you an "Adobe Flash" dialog that attempts to start recording your video message through your webcam. 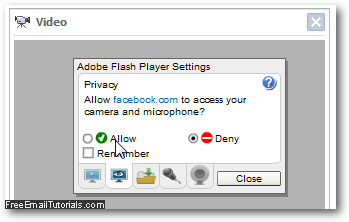 For security reasons, this feature requires your permission first: click on the "Allow" radio button, and optionally check the "Remember" checkbox to allow Facebook to use your webcam without your permission in the future (if you feel comfortable doing that). Then, just click on the Send button to email your attached picture file or photo in your Facebook message. The Facebook user to whom you email your picture will see it as a thumbnail - when clicked, the image will open in its full size preview popup. This is how you send a picture file attached to an email from Facebook, or send a photo of yourself inside a message. As mentioned earlier, Facebook also allows you to email links to images you found online, something we'll cover in a later tutorial.